MANILA, Philippines - State weather bureau PAGASA in an update released on Thursday as of 11pm (December 4, 2014) said that Typhoon Ruby (international name: Hagupit) has maintained its strength as it continues to move west northwest towards Eastern Visayas. At 10:00 PM today, the eye of Typhoon Ruby was located based on all available data at 610 km East Northeast of Surigao City or at 570 km East of Guiuan , Eastern Samar (11.1°N, 130.9°E). Typhoon Ruby is forecast to move West Northwest at 15 kph. 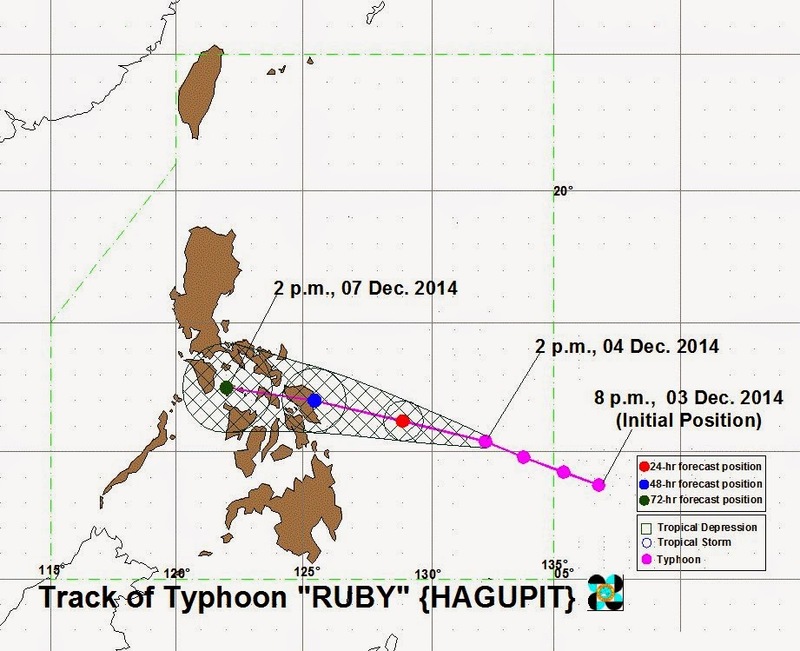 The near-super typhoon 'Ruby' is expected to be at 270 km East of Borongan, Eastern Samar tomorrow evening (December 5). By Saturday evening, it is expected to make landfall over the Eastern Samar-Northern Samar area. By Sunday evening, it is expected to be at 65 km East of San Jose, Occidental Mindoro. Public Storm Warning Signal 2 (Winds of 61-100 kph is expected in at least 24 hrs) was raised in Northern Samar, Eastern Samar, Samar, Biliran, Leyte and Southern Leyte in the Visayas region and Dinagat Island and Siargao Island in Mindanao. PAGASA advised residents of the impacts: moderate damage to agriculture, rice and corn adversely affected, few large trees uprooted, large number of nipa and cogon houses partially or totally unroofed, some old galvanized iron roofing may roll off and ravel by all types of sea vessels is risky. Meanwhile, Public Storm Warning Signal 1 (Winds of 30-60 kph is expected in at least 36 hours) declared in Catanduanes, Albay, Sorsogon, Masbate including Ticao Island (Luzon); Northern Cebu including Bantayan Island and Camotes Island and Bohol (Visayas) and Surigao del Norte, Surigao del Sur, Camiguin Island and Agusan del Norte (Mindanao). Here are the impacts of Signal No. 1 according to the weather central: twigs and branches of trees may be broken, banana plants may tilt or land flat on the ground, rice in flowering stage may suffer significant damage, some nipa and cogon houses may be partially unroofed and sea travel of small seacraft and fishing boats is risky. Eastern Visayas and the islands of Dinagat and Siargao will experience stormy weather while the rest CARAGA and the provinces of catanduanes, albay, sorsogon, ticao island, masbate, northern Cebu including Bantayan island, Camotes island, Bohol and Camiguin island will have rains with gusty winds and the coastal waters along these areas will be rough to very rough. The rest of Bicol region, Visayas and Mindanao will be cloudy with light to moderate rainshowers and thunderstorm. Cagayan valley, Cordillera and Ilocos region will have cloudy skies with light rains. Metro manila and the rest of Luzon will be partly cloudy to cloudy with isolated rainshowers or thunderstorms. Moderate to strong winds blowing from the northeast will prevail over the rest of Luzon and of Visayas and coming from the northeast to northwest over Mindanao and the coastal waters along these areas will be moderate to rough. 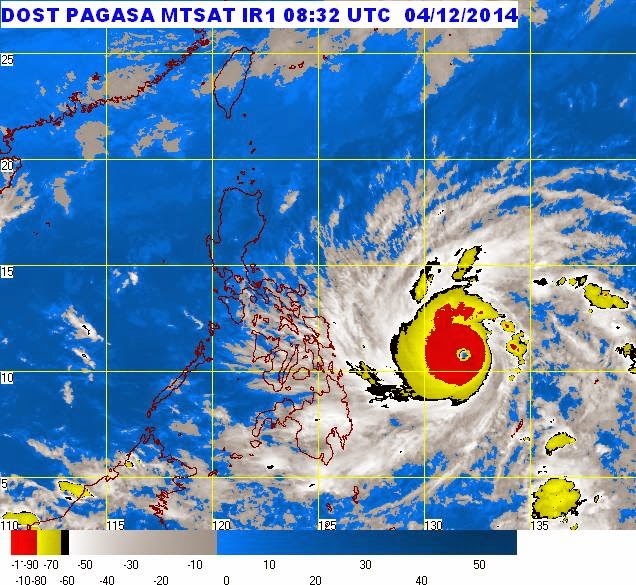 The estimated rainfall amount is from 7.5 – 20 mm per hour (heavy – intense) within the 700 km diameter of the typhoon. Moderate to heavy rains within 24 to 36 hours are expected over the areas with Public Storm Warning Signals Numbers 2 and 1. Residents in low lying and mountainous areas are advised to be alert against possible flashfloods and landslides. Moreover, those living near coastal areas are alerted against possible storm surges. 'Ruby' and the Northeast Monsoon will bring rough to very rough sea conditions over the seaboards of Northern Luzon, eastern seaboard of Central and Southern Luzon, over the seaboards of Visayas and over the northern and eastern seaboards of Mindanao. Fisherfolks and those using small seacraft are advised not to venture out over the said seaboards.